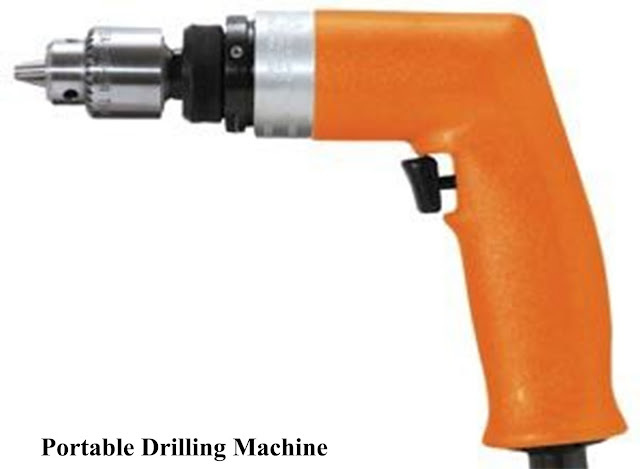 Home Sensitive drilling machine What are the types of Drilling Machines available? What are the types of Drilling Machines available? This type of machine can be used in complicated places, where there is no convenience for drilling a hole with standard drilling machines. As the name indicates it is portable, it is light in weight and smaller in size. This machine is driven by individual motor and sometimes driven by pneumatic power. The maximum size of drill that it can accommodate is 12 mm or 1/2”. These machines are designed for drilling smaller holes at high speed in light jobs. The machine may be mounted on a bench or on the floor. It has vertical column and horizontal table. The motor is supported on the head. It is attached with V cone pulley. The driving mechanism and the spindle also having V cone pulley is mounted at the front of the drilling machine. There is no arrangement for automatic feed to the drill spindle. The drill is fed into the job purely by hand control. High speed and hand feed is required for drilling small holes. Hand feed permits the operator to feel or sense the progress of drill into the work. When the drill is blunt or struck for any reason the pressure of the drill may be released immediately to prevent it from breakage. That is why it is called sensitive drilling machine. The capacity of drill that can be held is from 1.5 to 15.5 mm. Super sensitive drilling machines are designed to drill holes as small as 0.35 mm diameter and the machine having a spindle speed of 2000 RPM. It can be moved in an arc up to 1800 around the column and can be clamped at any position. This permits the work to be supported on the base of the machine and the arm can be swung out of the way for drilling heavy and odd size work pieces. Lastly, the table can be rotated 360about its own centre to locate the work under the spindle. This type of drilling machines is designed for medium to large and heavy work pieces. The machine is having a vertical column mounted on the large base. The column is supported by radial arm which can be raised or lowered to accommodate work pieces of different heights. The arm can swing horizontally to any position around the column over the work. The drill head mechanism for rotating the spindle and feeding the drill is mounted on the radial arm can be moved horizontally to and fro from the column then it is clamped at any desired position. These three movements in a radial-drilling machine when combined together permit the drill to be located at any desired position. When two or more holes are to be drilled in a work piece, the position of the arm and drill head is altered so that drill spindle can be moved from one hole to another without altering the setting of the work. If the work piece is too big it can be clamped directly on the base. The gang drilling has a number of spindles. Columns are positioned side by side on a common base and have a common worktable. The space between the spindles can be altered by adjusting the columns. The speed and feed of the drills are controlled independently. This type of machine is especially used for production work. Each spindle may be set up properly with different tools for different operations. The main purpose of this type of drilling machine is to make number of holes in a work piece simultaneously or for reproduction of same pattern holes in a number of identical pieces in mass production work. The machine has several spindles driven by a single motor. 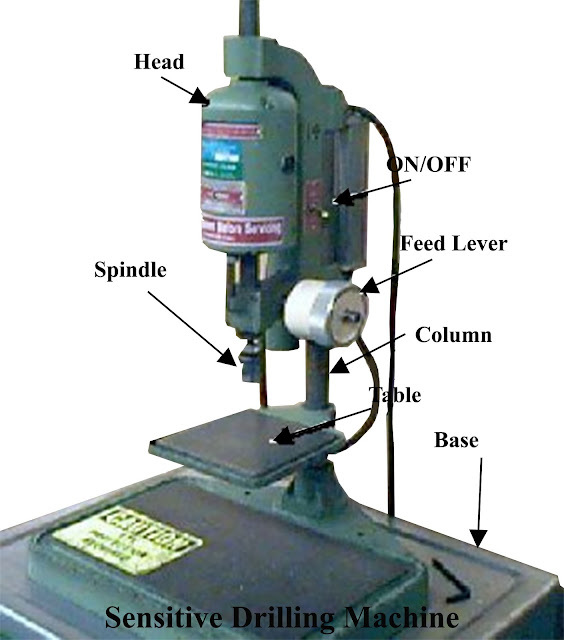 The feeding of the drill is by raising the worktable and sometimes the feeding is given by lowering the drill head. The spindles are so designed that each spindle centre distance can be changed to any position as per the capacity of drill head. The spindles are connected to drive by universal joints. This is one of the special type of drilling machine used for drilling deep holes in rifle barrels, crank shaft and long shaft, etc. Generally speed is high and feed is low and sufficient quantity of lubricant is pumped to the cutting point for removal of chips and cooling the cutting edges of the drill. The work generally rotates and the drill is fed into the work. In some machines both work and drill rotates for accurate location. 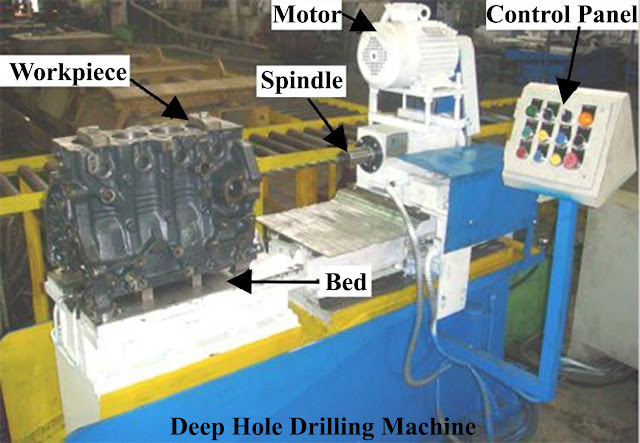 The deep hole-drilling machine can be of horizontal or vertical type. The drill is automatically withdrawn each time when it penetrates in to the work equal to its diameter. This process permits the chips to clear out from the work. Its brimming with data I am searching for and I want to post a remark that "The substance of your post is wonderful" Great work.